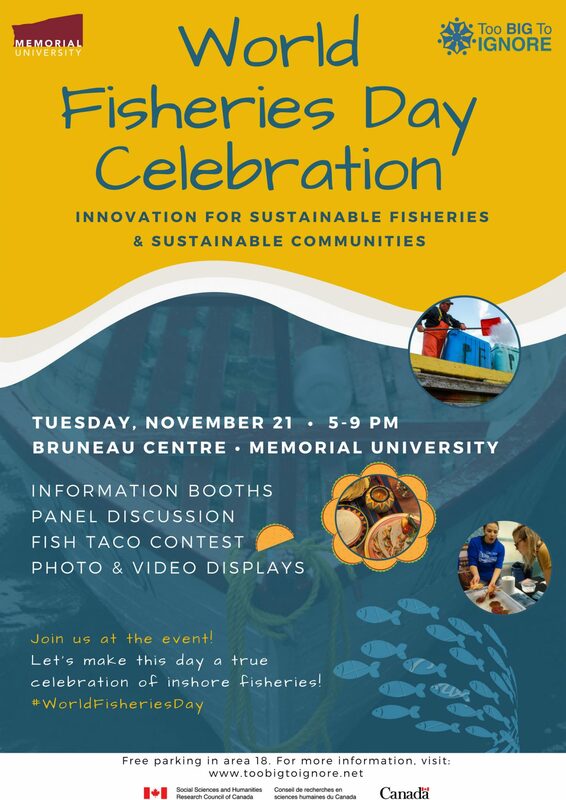 For a third year in a row, TBTI marked the World Fisheries Day with a public event packed with a suite of activities. 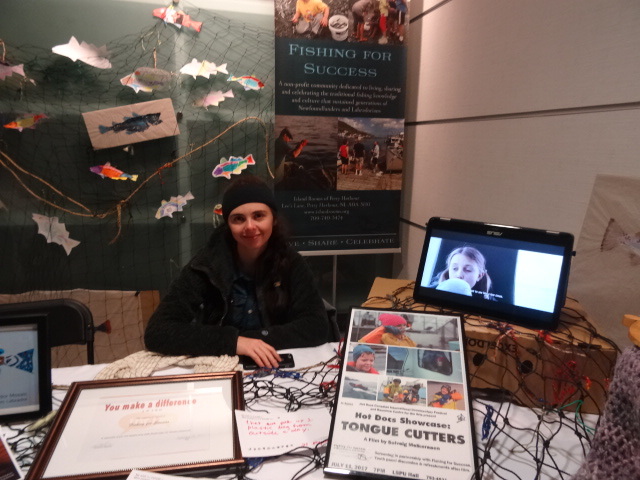 This year’s event was organized around the themes of fisheries, sustainability and innovation. The event promoted the value of fisheries, in particular in-shore fisheries, to the economic, environmental, and social well-being of our province and built a case that we cannot have a sustainable province without sustainable fisheries. Alicia Saldaña Millan and her winning 'Tacos capeados' (Beer batter fish taco). 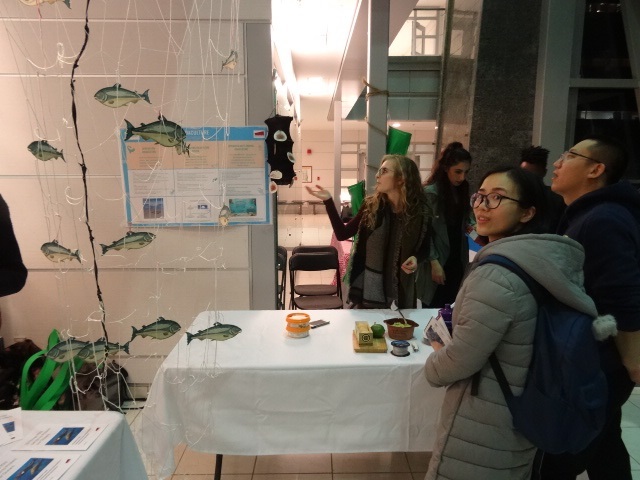 As in the previous years, we showcased aquatic-related research and education and highlighted how local fish and seafood can be part of healthy lifestyles and viable communities. 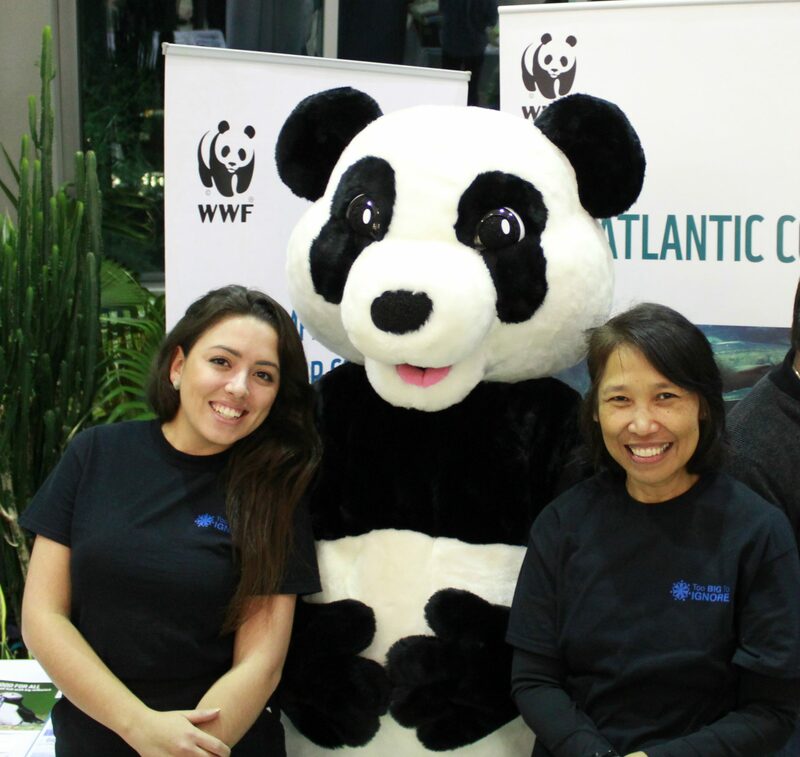 This was done through interactive information booths by fisheries and ocean-related organizations and TBTI members, partners and friends; students’ exhibition; and photo and video displays. The audience had a chance to taste the fish tacos prepared by the three contestants of the ‘Fish Taco Contest’ and vote for their favourite taco. 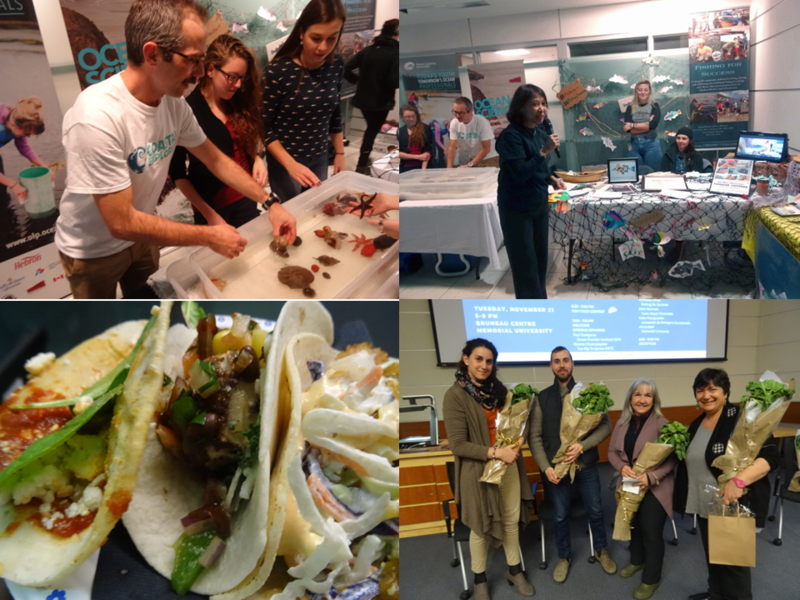 The 'Fish Taco Contest' is a way to not only enjoy the excellent fish dishes but also foster a conversation about the important value of fish for food security and nutrition. 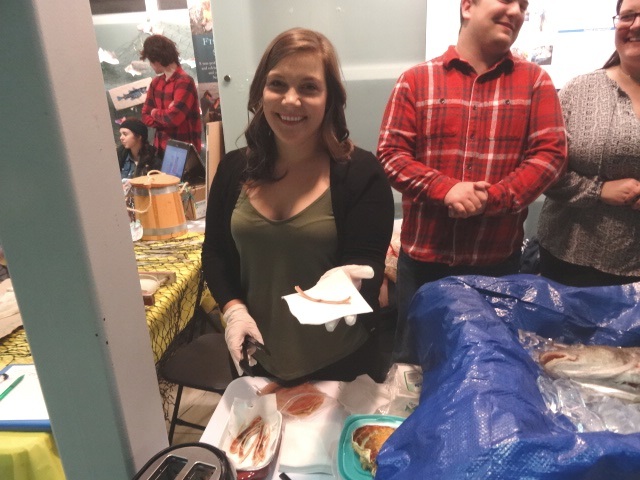 The fish taco contestants included Alicia Saldaña Millan (MA student in Geography, Memorial University), Katia Frangoudes (Senior Researcher, University of Brest, France) and Maurizio Modica (chef at St. John's Fish Exchange Kitchen & Wet Bar). Panelists (from left): Alicia Said, John Norman, Kimberly Orren and Katia Frangoudes. 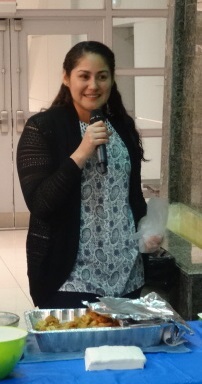 Ratana Chuenpagdee, TBTI Project Director, moderated the discussion. A panel discussion on 'Innovations for sustainable fisheries and sustainable communities' concluded the event, encouraging conversation about the types of innovation, e.g. social, market, technological and governance that could lead to sustainability in fisheries and communities in Newfoundland and Labrador. 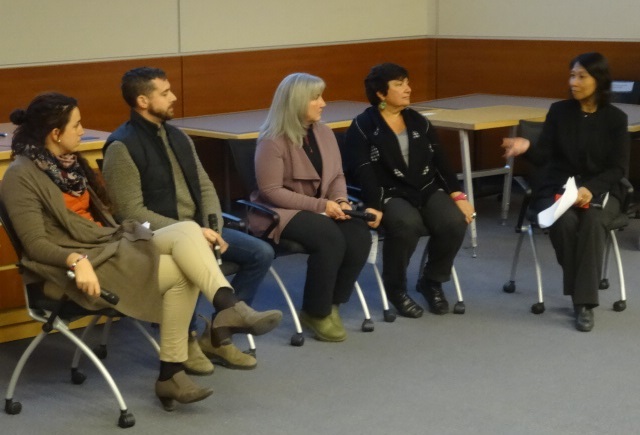 Panelists included Kimberly Orren, Fishing for Success, Petty Harbour; John Norman, mayor, Town of Bonavista; Katia Frangoudes, gender specialist and professor, Université de Bretagne Occidentale, France; and Alicia Said, postdoctoral fellow, TBTI. A selection of comments under the main topics discussed during the panel is provided below. The topics related to the question of what kinds of innovations are needed in order to achieve sustainable fisheries and communities. The comments also highlight some of the preconditions and barriers for success in bringing innovation to small-scale fisheries and fisheries-based communities in our province. To see a full recording of the panel, scroll to the bottom of the page. - Reconnect with the fishery and ecosystems, as well as with our natural and cultural heritage. The emphasis must be placed on creating an immersive experience. - The people in this province are taught about the ecology and environmental science of others places in Canada. We should have experiential learning that teaches students about the environment while directly getting people in touch with the province’s ecology. 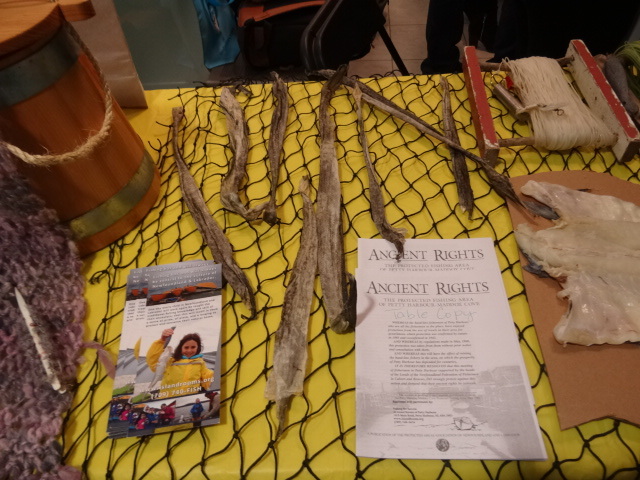 The school curriculum should be geared towards the ocean and experiences around the ocean. - Place a strong emphasis on engaging young people in the fishery and include them in the discussions about the future fishery. - There are high barriers to entry for young people to get involved in the fishery. Fish licenses are extremely expensive and the transfer of licenses depends almost entirely on family relationships. - The provincial government is opening up farm land for young people to start farms as part of their agricultural strategy. Maybe we should be doing something similar with the fisheries. - Forge a new connection between women and fishing while trying to address gender inequalities in the fishery. One program that is trying to do exactly that is Fishing for Success’s ‘Girls Who Fish’ initiative. - Move away from the misconception that women cannot be involved in the fishery and that they cannot do the same job men do. - Nurture a sense of place and capitalize on the sense of place and place capital. This ultimately improves the livability of the community and attracts new people in the community. - Bring young people to a community who can then become inventors and members of the creative economy. - The main precondition for any innovations in sustainable communities is making the community livable so that it matches the expectation of young people regarding lifestyle and amenities. - Stop thinking of fish as a commodity and realize that fish is food and an essential food source for our communities. - Value-added products are a growing market but it isn’t how the fishery has historically operated in the province. Most fisheries management policies are geared towards high-volume, low-value, frozen fish, which is why need a cultural shift as well as an industry shift. - Show the value of buying and eating the whole fish and teach people how to use and process the whole fish. We also need to introduce new varieties of fish and new species into people’s diets. - Challenge the assumption that 65% of the fish is waste. This priority needs to be tied into the provincial food security strategy and into strategies to reduce food waste. Look for full utilization and re-purposing opportunities for ‘fish waste’ with an ultimate goal of using 100% of the fish. See you next year for the World Fisheries Day! This World Fisheries Day celebration brought together about 70 participants interested in and committed to supporting sustainable fisheries in the province. The event showcased leading research and initiatives happening to improve fisheries, but also emphasized the need for more innovation and action to renew our fishery and rural communities. Dr. Chuenpagdee closed the event by reiterating the importance of working collaboratively towards creative solutions and innovation in research and policy, in order to promote the sustainability of small-scale fisheries in Newfoundland and Labrador, and elsewhere.